Sip this tea and kick back for a mini-vacation any day of the week. Like a warm tropical breeze, Caribbean Nectar soothes you with its creamy, sweet notes of banana, pineapple, and coconut. 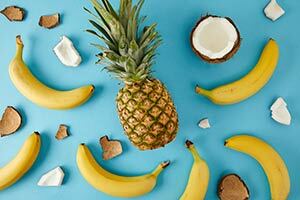 Velvety smooth and oh-so-fruity, it's like a pina colada without the calories. Can you hear the calypso music and feel the sand between your toes? "If you like pina coladas"... you'll love this tea. Sweet notes of banana, pineapple and coconut blossom in your mouth with every sip. The mouthfeel is rich and creamy, but a playful lightness leaves you feeling relaxed and refreshed. 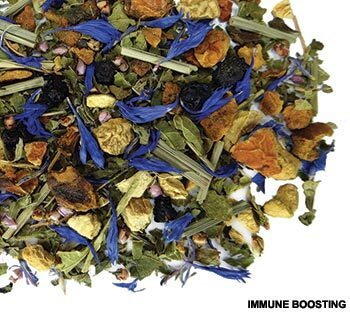 Ingredients: Banana and coconut chips, rooibos, mango flakes, pineapple and papaya flakes, orange slices, flavor. Enjoy this silky-smooth infusion with a fruity dessert to complement the tropical fruit overtones. Pair it with a tropical fruit tart, coconut mousse or strawberry shortcake with fresh whipped cream. Pineapple was given its English name because of how the exterior resembles a pine cone. Native to South America, pineapple is now a quintessential fruit of the tropics. Sweet and zingy, pineapples are rich in vitamin C, manganese and thiamin.